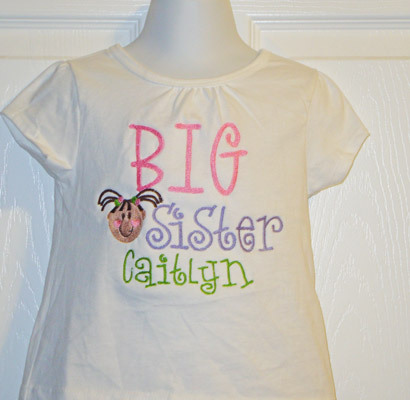 This is for an embroidered Big Sister shirt personalized with the big sister's name. The words "soon to be" can be added to the top, as in the photo, or left off. This comes in either long sleeve or short sleeve.� The hair color of the girl in the design can be changed to match the big sister. The other colors of the design can also be changed. Everything can be customized. I love to embroider your ideas! Please feel free to ask any questions.